“Shrek The Musical” has a special place in my heart: It was the first Broadway musical my son has seen. Though I find it impossible that he remembers any of it, he swears that he does. So I’m super excited to see that this twisted and fun fairy tale will be staged at The Rose Theater starting this Friday! If you’ve been thinking of going, read on – there’s a chance to win tickets at the end of post! 1. 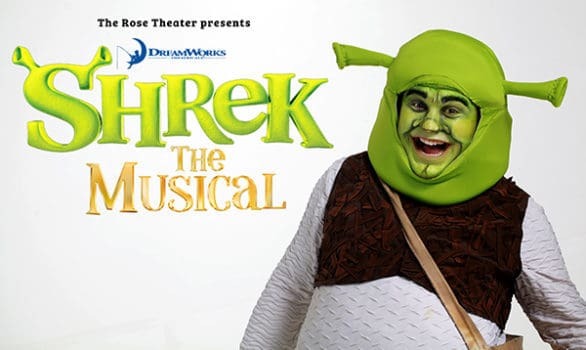 This version of “Shrek The Musical,” which has been adapted specifically for young audiences. This version is 75 minutes long with no intermission, making it a condensed version of the Broadway version. It still has “Let Your Freak Flag Fly,” so don’t worry. 2. The familiar characters from the movie are in the musical, including Dragon, the tiny Lord Farquaad and Gingy. I bet you’re curious how costume designer Sherri Geerdes created the look for Lord Farquaad, aren’t you? 3. It has an important message for children: All of us have a place in this world. 5. This show is recommended for ages 5 and older. When: Sept. 30 through Oct. 16; performances are Fridays at 7 p.m., Saturdays at 2 and 5 p.m., and Sundays at 2 p.m. There will be additional performances on Sunday, Oct. 9, at 5 p.m. and Sunday, Oct. 16, at 5 p.m. The 2 p.m. show on Saturday, Oct. 8, will be interpreted for people who are deaf or hard of hearing; the 5 p.m. show on Saturday, Oct. 8, is designated as sensory-friendly, with special accommodations made for families attending with a child on the autism spectrum. Cost: $20; discount ticket vouchers are available at all area Hy-Vee stores. Members receive four FREE tickets. Purchase tickets online here. 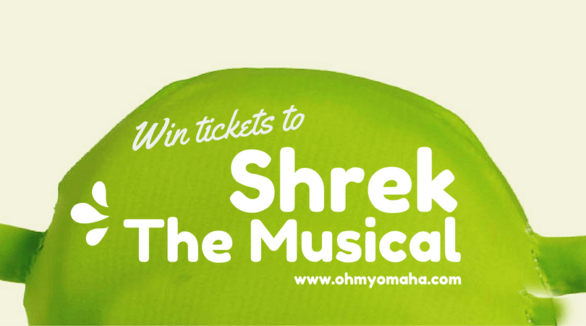 The Rose has teamed up with me to give one reader FOUR tickets to see any 5 p.m. performance of “Shrek The Musical.” It’s easy to enter using the Rafflecopter form below! Must 18 or older to enter. My favorite character is Donkey. He just makes me laugh with his raw humor and pithy comments. Thanks for writing a very helpful blog as we are new to Omaha! My favorite character is Puss in Boots. He’s a wee little cat…until the claws come out! And he’s very loyal to his friends. It’s gotta be the goofy donkey!